In our last two blog posts, we discussed stem cells for cats. In addition to arthritis, stem cells may be beneficial for felines with Chronic Kidney Disease (CKD) and Inflammatory Bowel Disease (IBD). In this week’s blog, we will discuss feline Gingivostomatitis. Gingivostomatitis is a disease affecting the mouth of felines. It causes oral pain which leads to other symptoms such as decreased appetite, reduced grooming, and weight loss. The most common treatment is extracting all the cat’s teeth, however only about 70% of cats will respond to this treatment. Those cats that do not respond will require lifelong treatment with medications. 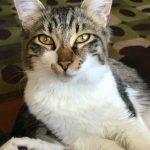 Two small studies on cats that had full mouth extractions conducted at the University of California Davis have shown that fat-derived stem cell therapy led to improvement or remission in the majority of cats treated. VetStem believes that fat-derived stem cells without full extractions may be beneficial. While a few veterinarians have seen favorable results using VetStem cell therapy, more investigation is needed. If your cat has Chronic Kidney Disease, Inflammatory Bowel Disease, or Gingivostomatitis, stem cell therapy may provide relief. Contact us today to locate a VetStem Credentialed veterinarian in your area. This concludes our “Stem Cell Therapy for Cats” blog series. Thanks for reading! If you have any questions, feel free to contact us at info@vetstem.com.